2016 Asphalt Paving Projects Completed! 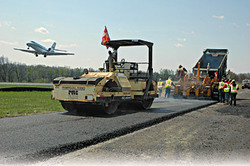 This past summer's four major joint funded (FAA 90% / TRK 10%) paving projects totaling over $4 million are now completed and all surfaces are open as of Thursday, October 13, 2016. The projects included: the eastern 4,000lf of parallel taxiway Alpha, the terminal ramp widening between Delta and Foxtrot, Jet Ramp reconstruction west of Alpha hangars, and the taxilane drainage and repaving at Golf and Hotel hangars. Hydro-seeding at disturbed earth areas and minor finish work has also been completed.